Online games have come a long way today allowing online gamers of all levels to browse through the internet and select the games they want to play! And thanks to web portals like HappySale that has made coupons and discounts on online games available and easy to browse, select and activate as well. Recently, Dream11 has become a popular name amidst the online gamers as it allows them to play fantasy cricket and fantasy football and if you use the discounts and offers that are listed on HappySale by this brand, you can get good discounts. For instance, there are deals where you can simply register and get a discount of Rs.100. In addition to that, you can play fantasy cricket and also win back a lucrative cash prize. You can refer the deals to a friend as well and win a great discount. So get your best deal today! Refer your friends to dream11 fantasy league website and get Rs 100 on every joinee. You can play fantasy cricket, fantasy football and fantasy kabaddi. Whats more, invite and earn points relevant to cash. Verified on 20/4/2019 . Refer your friends and family members to dream11 fantasy league and get Rs 100 cash for every refer who registers from your referral. You can play fantasy cricket, fantasy football and fantasy kabaddi. Whats more, invite and earn points relevant to cash. No coupon code required to get this offer. Select a match, Create your Dream11 Fantasy Cricket team, Join league and challenge friends, Score points to win based on real matches. Sign up at dream11 fantasy league and get Rs 100 cash. You can play fantasy cricket, fantasy football and fantasy kabaddi etc. Want more, invite and earn points relevant to cash. Verified on 20/4/2019 . Dream11 brings you the joyful of online cricket leagues and gives you a chance to win up to Rs 5 lakhs worth prize money. Click on activate offer now to join the cricket league. No coupon code required to avail the deal, valid for all users. Cricket being a popular sport consumes the mind space of several men across all age groups! Which is why if there’s anything to do with cricket, every cricket lover would love to get involved and derive some pleasure out of it. 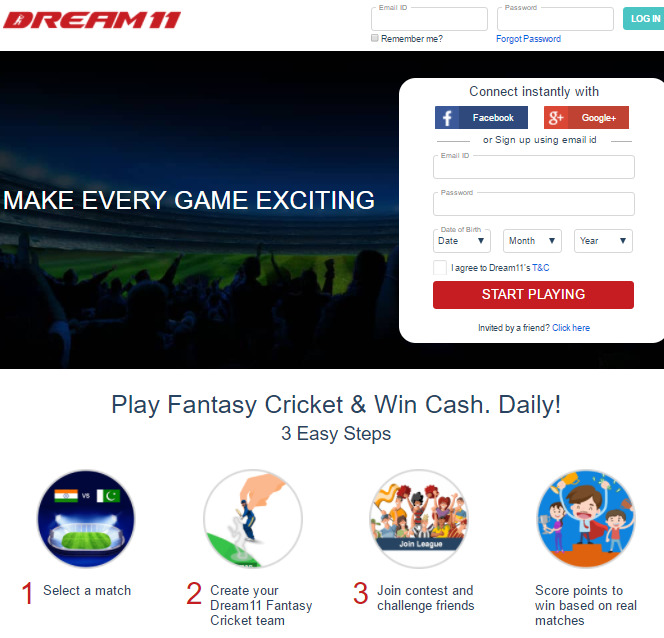 This is where the online world has expanded leaps and has made it possible for Dream 11 web portals to emerge that allow cricket lovers to make use of their knowledge and take part in fantasy cricket game and also win cash prizes online. And that isn’t all. Discounts and deals occupy the second part of this pleasant surprise. With websites like HappySale today, people have the chance to make the most of the Dream 11 coupons that are listed online so that they can opt in for the same based on their requirements. You always have the chance to select from the wide range of Dream 11 promo codes that are available online on HappySale, as there are several types of offers to select and get fabulous discounts. For instance, if you refer your friend to this website you have the chance to enjoy an Rs.100 off on your games. There’s more. There are also great offers on your registration that provides you with similar discounts as well. This is done to welcome more and more players to the website. You can also opt in for the coupons that allow you to make the most of playing fantasy cricket and also win exciting cash prizes as well. The deals have the codes that you need to decipher by opting in for the “show code” option and use it whilst making your final billing and your discount percentage will be provided to you. To be able to make the most of the Dream 11 coupon codes all you need to do is keep browsing from HappySale and then opting in for the offers that you chance upon. All you have to do is read the deal details and select the deal prior to the expiry date.